Destiny: Xur weapons, gear, and location, October 14 - 16. Trespasser! Xur, Destiny’s weekend Exotic trader, marine photography phenomenon, and impassioned discreditor of alternative therapy snakeoil merchants, is back. This week he’s in the Tower, over near the Speaker for the second time in two weeks. It’s a weird love/hate thing. Mostly hate, but Xur’s really committed to it. ‘Anyway, what’s Xur selling this weekend?’, you might well ask. ‘This stuff’, I might well respond, if I was being honest. Any of it good? Yes, actually. Trespasser is a pretty handy Sidearm indeed, packing a silly rate of fire, very good impact for its weapon class, a nonsense of a fast reload speed, and a signature perk that delivers longer, more powerful, more accurate bursts of fire every time you reload after a kill. And it’s already deadly accurate out of the box. As for the armour, Warlocks and Hunters do the best this week, the former’s Sunbreakers increasing the duration of solar grenades and giving an extra solar grenade charge for each gauge filled – though as such they are entirely subclass-specific, and it’s debatable whether Sunsingers might prefer the Heart of the Praxic Fire. The Hunters’ Bones of Eao add an extra jump, however you have your air-based bounding set up. Doubles become triples, triples become quadruples. Basically, no-one in the Crucible will see that fourth one coming, and you can waltz over tough mobs in the Archon’s Forge with ease. As for Titans, the Mk. 44 Stand Asides just extend the duration of your shoulder charge and give you a tighter turning circle while sprinting. Handing for setting up mobile kills in the Crucible, but probably not essential. And two weapon ornaments make your guns look prettier. Or more garish. But definitely different. 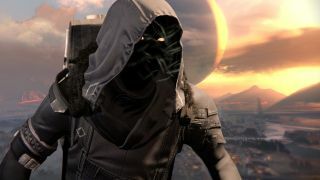 As ever, Xur will be around until 10am UK / 2am PT on Sunday, at which point he’ll leave without even saying goodbye.